Ofloxacin ophthalmic solution 0.3% is a sterile ophthalmic solution. It is a fluorinated carboxyquinolone anti-infective for topical ophthalmic use. Active: ofloxacin 0.3% (3 mg/mL). Ofloxacin ophthalmic solution is unbuffered and formulated with a pH of 6.4 (range - 6.0 to 6.8). It has an osmolality of 300 mOsm/kg. Ofloxacin is a fluorinated 4-quinolone which differs from other fluorinated 4-quinolones in that there is a six member (pyridobenzoxazine) ring from positions 1 to 8 of the basic ring structure. Tear ofloxacin concentrations ranged from 5.7 to 31 µg/g during the 40 minute period following the last dose on day 11. Mean tear concentration measured four hours after topical ophthalmic dosing was 9.2 µg/g. Corneal tissue concentrations of 4.4 µg/mL were observed four hours after beginning topical ocular application of two drops of ofloxacin ophthalmic solution every 30 minutes. 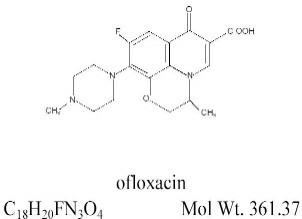 Ofloxacin was excreted in the urine primarily unmodified. Pregnancy Category C: Ofloxacin has been shown to have an embryocidal effect in rats and in rabbits when given in doses of 810 mg/kg/day (equivalent to 9000 times the maximum recommended daily ophthalmic dose) and 160 mg/kg/day (equivalent to 1800 times the maximum recommended daily ophthalmic dose). These dosages resulted in decreased fetal body weight and increased fetal mortality in rats and rabbits, respectively. Minor fetal skeletal variations were reported in rats receiving doses of 810 mg/kg/day. Ofloxacin has not been shown to be teratogenic at doses as high as 810 mg/kg/day and 160 mg/kg/day when administered to pregnant rats and rabbits, respectively. Note: Store at 20-25°C (68 - 77°F) [see USP Controlled Room Temperature].